Over the past couple of months I’ve been sadly negligent in writing posts about our walking and hiking outings — the last post was last September, about plans for a hike to a pair of historic plantations in Maryland. But it’s not because we haven’t been busy: we’ve done over 30 hikes since then, including the visit to the plantations. It’s just that in the process of 1) planning, 2) executing, and 3) writing posts about hikes, if I’m running low on energy, it’s the last of those activities that gets curtailed. And I have been short on energy — a cold that jumped me in late November finally turned into pneumonia during the last week of December, so it was a struggle to get on the trail at all. But as of January 1st I’m back in stride again, so I’ll try to post about our hikes a little more often. The weather forecast for Saturday, January 9, was looking pretty rainy, so I planned a mud-free 5-mile hike around the sidewalks of Old Town Alexandria. Our route took us all around town, past several familiar landmarks and along the Potomac waterfront. As it turned out, the rain held off and we enjoyed a nice walk around town. 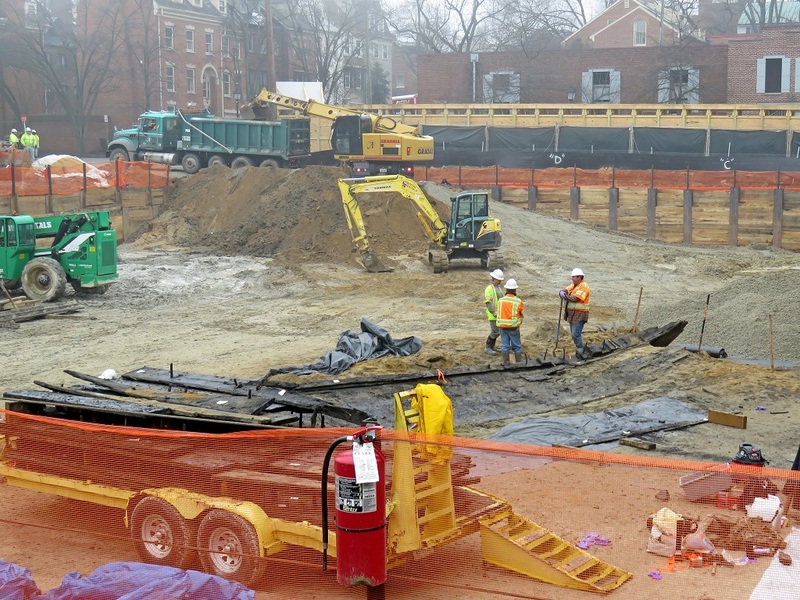 In a pleasant surprise, we encountered a little history unfolding along the waterfront: the remnants of a centuries-old ship discovered during the excavation of the lot at 220 S. Union Street, for the eventual construction of the planned Hotel Indigo. That evening, NBC News published an interesting news story about the ship’s discovery and excavation. The ship, of which only a partial hull remains, was once a heavy wooden cargo or military ship and was scuttled at the site sometime between 1775 and 1798 as part of the Alexandria waterfront development that has been going on for centuries. In fact, were it not for the hotly contested current development, this discovery would probably never have been made at all. I suppose people are always resistant to change, but the five-story hotel planned is not a glitzy glass and steel skyscraper. 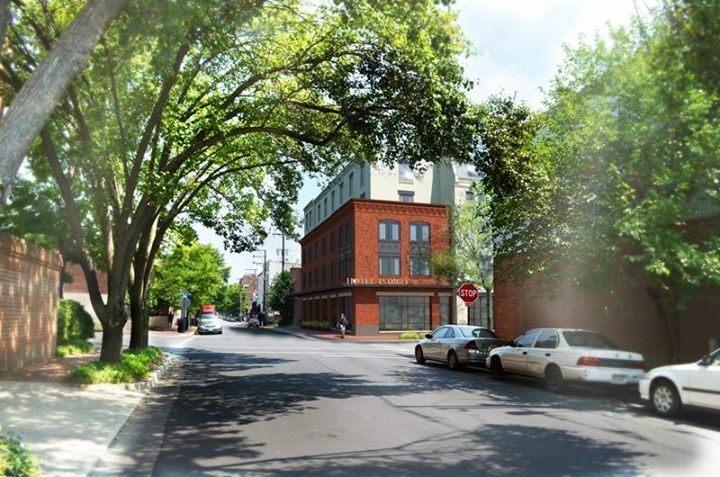 If it turns out to be anything like the artist’s rendition posted on the hotel’s Facebook site, it will fit into the existing neighborhood architecture nicely and be quite an improvement over the long-dormant brick and corrugated steel warehouses that were at the site. By the time we arrived, most of the ship’s timbers had been removed and stacked on a flatbed, awaiting shipment to a water storage tank to stabilize the wood until its final disposition is determined. Hopefully, and if funding can be found, the ship and some of the many other artifacts uncovered can someday go on display. This entry was posted in Hiking, History, News, Uncategorized and tagged archeology, Hotel Indigo, old town alexandria, outdoors, Potomac River, ship. Bookmark the permalink. Multiple footnotes for a blog entry?!? As a fellow blogger, you have made me feel inadequate. It’s great to see you rebounding so strongly from the pneumonia. I hope 2016 brings only good surprises. Great story, you have to keep us up on your hikes for sure. The fun part was building the Google map and figuring out how to embed it into WordPress. Now that I’ve done that, it won’t be long before either Google or WordPress “improves” something so I have to relearn the entire process. Thanks, John. I’ll tap your expertise on WordPress blogs on the next hike. Their software is good and only occasionally maddening. Fascinating & hope you continue to feel better. Looking forward to more hikes!